Cemetery in Middle Village Queens New York. 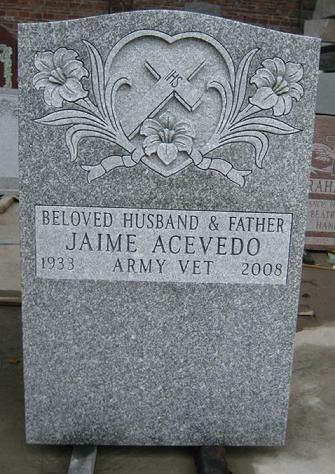 Supreme Memorials, Inc. provides the finest memorials in St. Johns Catholic Cemetery in Middle Village Queens NY. A website dedicated to serving the families. Your decision to purchase a memorial is an important one and the choice of material and design should be carefully made. The material and workmanship are particularly important because of the great length of time the memorial will stand. The design and symbolism should be carefully chosen to express those sentiments and feelings you wish to convey. Whether you require a marker, a family monument or a mausoleum, we offer our sympathetic counsel and sincere advice to help you make a selection that will give you lasting satisfaction. Supreme Memorials, Inc brings integrity that's as solid as our carefully selected stone. Dedicated to the task of serving your needs, choose from our vast selection of monuments suitable under the rules and regulations of St. Johns Cemetery located in Middle Village Queens. Our designers are thoroughly informed of specifications of St.Johns Catholic Cemetery. The quality of our work is such that we GUARANTEE IT.